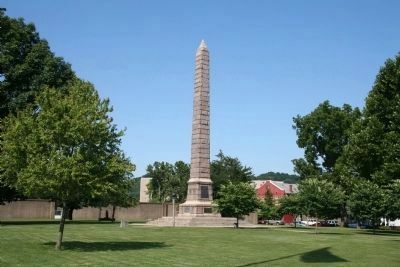 Point Pleasant, WV is my home town, the place where I was born and raised. The seat of Mason County, it was once a thriving community but today the down town probably has as many business closed as open. Like the rest of the state, the population is on the decline, down 6.1% since 2000. The 2014 population was 4,359. 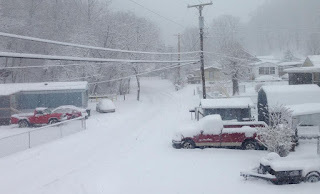 The small community of Campbell's Creek, WV has a Methodist Church, a gas station and a few stores. The few famlies there go back for several generations. Simon Kenton had a hunting camp at Campbell's creek when it was all a wilderness. The Indians broke into his camp and killed one companion. Kenton and his other companion ran bare foot and naked 46 miles in the snow and ice to Point Pleasant where they were rescued. Today the area is crime ridden and almost as dangerous as when Kenton camped there. 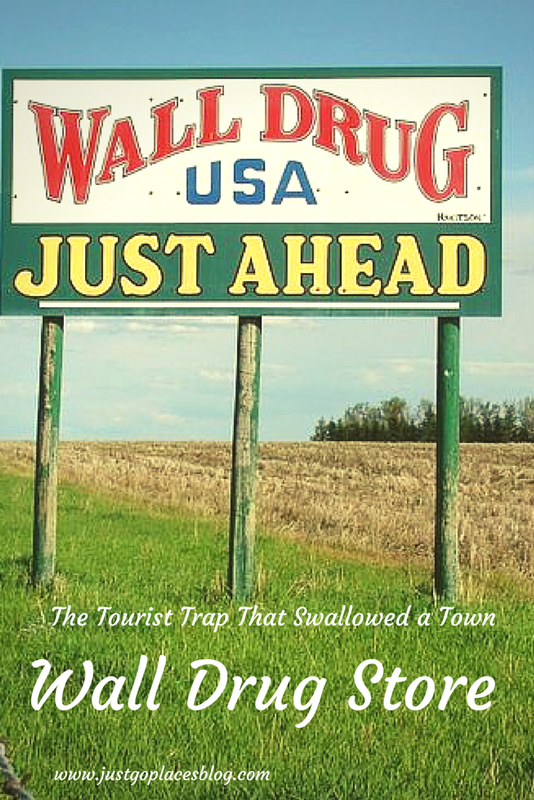 An entire blog, or two, could be written about Wall, South Dakota. It was a highlight of my and Julie's three month trip around America in 1981. In 1931, Ted Hustead had graduated from Pharmacy School and had been working at different drug stores. From a $3,000 legacy from his father, he went looking for a drug store to buy and found one in a small prairie town of Wall, SD. With his wife, Dorothy--a high school teacher--and young son they made their home behind a blanket stretched across the store. Wall was made up of only 326, mostly farmers wiped out by the depression and a drought and in five years there was no growth in the store. Then, they got a great idea. They had a deep well with cold water. On a major east west highway, people were offered FREE ICE WATER.. From that day forward they have been swamped. 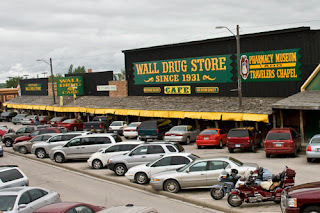 Today you can get anything at Wall Drug store, from furnishing your home to exploring the Nile. See a dinosaur or ride a "jackalope", it's all there. 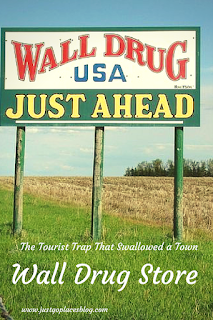 You will see WALL DRUG STORE signs around the world--I'm looking at one in my office. Yes, you can get a prescription filled. Wall Drug gives away 20,000 cups of water a day. Coffee is a nickle, free with donuts for a lot of people, from honeymooners to veterans. They have barracks to house the college students that live and work there in the summer time. They take in $10 million dollars a year from two million visitors. A REAL SUCCESS STORY FOR A SMALL TOWN. See...something good came out of Campbells Creek! haha!